One of the rarest and most exciting events in space exploration is when we land on another celestial body and achieve a boots-on-the-ground view of an alien world. 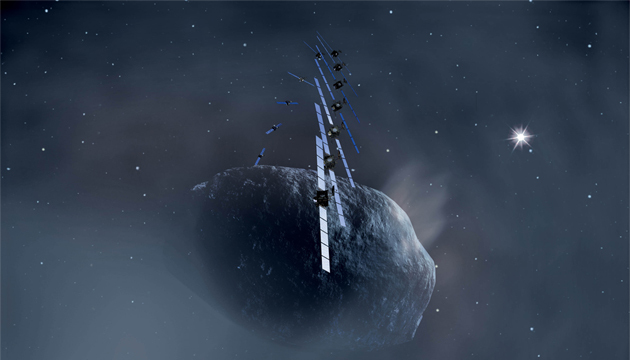 Europe's Rosetta mission is now poised to add another extraterrestrial landfall to that very short list, and top a new list as it becomes the first mission to land a probe on a comet. Since we began traveling space in 1957 we've only landed on a handful of celestial bodies: Earth's Moon, Mars and Venus, Saturn's moon Titan, and the asteroid Eros (which was less a true landing than a low-speed crash while taking pictures on the way down). The European Space Agency's (ESA) Rosetta spacecraft, launched in 2004, is now on a final approach to the comet 67P/Churyumov-Gerasimenko for an August 6th rendezvous, and already the preliminary pictures it has taken are revealing that this comet may be a greater treasure trove of information than expected. Pictures show what appears to be a double-lobed nucleus, a possible "contact binary," a configuration we've seen in a few other comets and some asteroids. The events that shape this style of comet nucleus are not known—because we've never seen it happen, and so far have not examined such an object up close and in detail...something that may be about to change. One possibility for the origin of a contact binary is a low-velocity impact between two different comets at some time in the past, such as when the solar system was young and full of comets, asteroids and planetesimals. The formation of the planets is believed to have occurred in a process of accretion, where small pieces of material join gravitationally with others and gradually "snowball" into larger and larger objects—comets and asteroids into planetesimals, planetesimals into planets. Since comets represent "leftovers" from the accretion of the planets, it stands to reason that we might find some in a state of partial assembly that did not snowball any further, and so should expect to find objects composed of two or more smaller building blocks: contact binaries. But obtaining landscape pictures of alien locales isn't the main reason for going sending a probe to land on a comet. Everything we know about our solar system's past and how the Earth, planets, and other bodies originated we have learned from remaining physical evidence. Just like forensic investigators piecing together the sequence of events, suspects, and actions at a crime scene from only trace evidence left behind, the physical state of planets, moons, asteroids, and comets and the details of their shape, composition, surface markings, locations and trajectories are all the information we have to reconstruct events and environments that took place millions or even billions of years ago. On planets like the Earth, whose surface has been shaped, erased, and reshaped untold times by weathering, sea level rise and decline, continental drift, tectonic action and volcanic activity, reconstructing the past becomes increasingly difficult the farther back in time we peer. But objects not subject to these forces, such as comets, asteroids and some of the airless planets and moons of the solar system, preserve physical evidence untampered-with by the mayhem of change. By studying not only the composition of a comet, but also its detailed physical structure, shape, and surface markings, we consider all of the trace evidence present, just as a good forensic scientist does not overlook even the smallest strand of hair, trace of chemical residue, or speck of exotic dust. Someday events like landings on comets and asteroids, dwarf planets and moons, may become commonplace and humdrum -- but not today! Feast your eyes on the first pictures from a comet while they're fresh!